As the trade deadline approaches -- 11 days and counting -- there still are questions about whether the Brewers will deal Prince Fielder or whether he is even worth the risk for those teams considering calling up Milwaukee about a trade. Although there likely are a couple of suitors, the Texas Rangers would ultimately create the perfect storm. 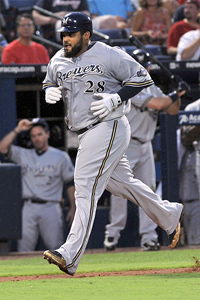 AP Photo/Gregory Smith Prince Fielder hit his 23rd homer Monday night. A bunch of teams would like to have that kind of clout in the lineup. If Texas can handle its ownership issues, it should make an aggressive push for Fielder. In addition to the prized slugger, the Rangers would have Vladimir Guerrero, Josh Hamilton and Nelson Cruz in the middle of their lineup. Plus, Cliff Lee now stands at the top of their rotation. Watch out Yankees! If Texas can get Fielder, it will be a serious problem for a lot of teams. A few teams that don't need him? The Mets, Braves and Yankees. However, there are a few other teams, aside from the Rangers, that I think would benefit from Fielder's presence: the Rockies, Rays, Giants and Dodgers. Even though Rockies first baseman Todd Helton is back after spending 15 days on the DL, he is not superior to Fielder. At one point, Tampa Bay was rumored to be pursuing Fielder, but it won't be going anywhere near his hefty price tag despite an underproducing Carlos Pena. Buster Posey, whom San Francisco has used both at first base and behind the plate, is producing at a high level for the Giants. But if San Francisco were to add Fielder, it could really do some damage because it would have legitimate power in its lineup coupled with exceptional pitching. Dodgers first baseman James Loney is a good hitter, but he doesn't provide a lot of power. If Los Angeles can pick up Fielder, it would essentially solve one of their biggest issues. Doubters say Fielder's size is a risk, but his father, Cecil Fielder, was a big man, and Prince has always been big. I met Prince when he was 12 years old. Cecil and I were playing in a charity softball outing, and Prince came with him. He was a big kid then. He will always be a big kid. I remember when I first got signed, I was 170 pounds and then I hurt my knee in A-ball and shot up to 200 pounds. Eventually, I played at 215 pounds, and I was overweight for my size. In Prince's case, this is not an abnormal thing for him. He's a big guy, but he's still very agile around the bases. He's similar to Ryan Howard, in that he's a big guy but they both carry their weight well and they actually have good feet. The only area where the pair differs is that Howard is a bit more consistent. People keep asking if Price Fielder is worth the risk, but I don't think he's a risk at all. He's a proven major league power hitter. He's not a great first baseman, but he's better than most and he can still get around the bases. Fielder will go from first to third, he can score from second on a single, and there's something to be said about having a father who was a major league player. He's been in clubhouses his entire life, and the baseball diamond is where he thrives. John Kruk is an analyst for "Baseball Tonight"
The Rangers got away with an 8-6, 14-inning win against the Tigers, but it would have come easier had they been more careful with Cabrera, who went 3-for-6, homered twice, walked once and drove home three runs to raise his average to .340. Silva lasted only one inning against the Astros. It wasn't pretty. He gave up seven hits, two walks and five runs to put the Cubs in a quick hole in a game they went on to lose 11-5. In his previous start, Silva went 1 1/3 innings, giving up six runs before being ejected. The Rangers' Tommy Hunter still hasn't lost this season; he's 6-0 in eight starts with a 2.39 ERA. Since his near-perfect game June 2, Armando Galarraga hasn't been involved in many decisions; he's just 1-1 in six starts. Wade LeBlanc is carrying around a 3.30 ERA, but only a 4-7 record. He is 0-3 over his past five starts but did not give up more than three runs in any of those outings. After starting 0-3, Jair Jurrjens is 2-0 over his past three outings. After consecutive losses that had people wondering if something was wrong with Tim Lincecum, the back-to-back Cy Young winner has allowed one run in 16 innings and picked up consecutive wins. Clayton Kershaw was roughed up by the Cardinals in his last outing, lasting only 4 1/3 innings.